I don't skimp on self-praise around here, but in all honesty I hadn't looked at our post count lately. What with all the MAYhem and other excitement that 2011 has brought us, I guess I'd lost track of how many posts had piled up. 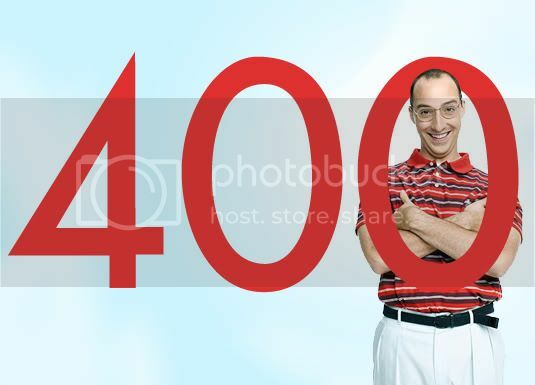 And wouldn't you know it, we're sitting smack-dab at 400. I guess this post makes 401...but anyway. It's also worth noting that May 28 marked our 4 year anniversary. Someone may want to check my math, but I do believe we're averaging about 100 posts a year. In fact, our 300th post was only about seven months ago. So thanks to all the readers who keep this measly little pet project going. Without the occasional user comment, new follower, or repost, I'd probably have given up on this thing a long time ago. So thank you all again, and here's to maybe--just maybe--hitting 500 before the year is out. You didn't even really need to write a post with that picture. Buster says it all. More Wilco News: New album on the way!